Dale Ila's career in agriculture began in college at Cornell, and she has worked as an educator at Cornell Cooperative Extension for many years. Presently, she is president of the New York State Berry Growers Association, and is actively involved in agricultural initiatives in the region. Don's background is in botany, soil science and public health, and he recently turned his efforts full time to the farm, implementing successful production and delivery practices to meet growing demand. Presently Dale Ila and Don are focused on effectively solving challenges farmers face with invasive insects. Research and testing of materials to protect crops has led to the development of a fine mesh netting that protects crops, safeguarding farmers from potential losses from crop damage. Their new company, Berry Protection Solutions, markets the netting and educates farmers on healthy options for protecting crops. "Dale Ila M. Riggs is a first generation farmer who took a worn out corn field and built a thriving 230-acre berry, vegetable and cut flower operation called The Berry Patch. 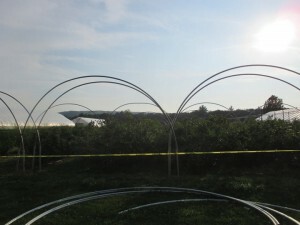 As an innovator in production methods, Dale-Ila was among the first in the U.S. to use high tunnels for raspberry and winter greens. Using low tunnels for strawberry production, she sells strawberries six months a year and her offers her other premium produce at the local Farmer’s Market and to 20 prestigious restaurants 52 weeks a year. A successful entrepreneur, she began selling produce to restaurants while still in graduate school. Dale-Ila is also an industry leader, currently serving as president of the New York State Berry Growers, where her leadership and innovation have been especially effective. The invasion of Spotted Wing Drosophila (SWD), a crop-damaging fruit fly, left the berry industry reeling. Dale-Ila approached Cornell to learn what was needed to fight this pest to keep the industry vibrant. Through innovative communication, persuasiveness and persistence, she convinced the New York Senate and the Invasive Species Council to commit $1.3 million over three years to fund research into controlling this pest. On her own farm, Dale-Ila conducted USDA research to exclude SWD from blueberries. The results are used nationwide to teach growers how to manage this pest. In workshops she helped organize, 96 percent of growers expressed confidence in knowing how to manage this pest. While working for Cornell, she was the first woman to win the National Crop Production Award for her research and education program in pumpkin production. She was also the editor and primary writer of the “Pumpkin Production Guide,” which earned three national awards. “Farmers who are innovative, action oriented and looking to the future have multitudes of opportunities, as long as they run their operation as a business first,” Dale-Ila says. “I think that farmers who are good at taking calculated risks and who are innovative communicators need to be identified and rewarded for working with legislators to create stable funding for investing in applied research for agriculture – that is where our future will be created.”"
The Berry Patch is a small scale, diversified, sustainable family farm in Stephentown, NY, that raises berries, vegetables, and cut flowers. Visit our Farm Store, our CSA and our stand at Troy Farmer's Market. The Berry Patch is a small scale, diversified, sustainable family farm that raises berries, vegetables, and cut flowers. Our motto is "Always fresh, exclusively local, growing twelve months a year."